12 award slots change to 24 without any tools needed! Plastic clicker builds anticipation & draws spectators over. Blank game display allows for complete customization! 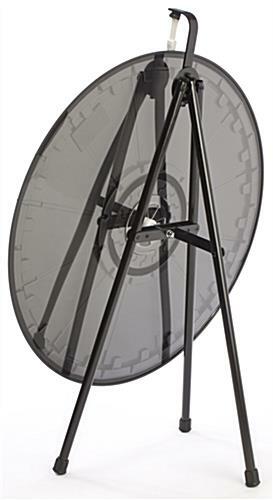 Spinning wheel is simple to use & set up. 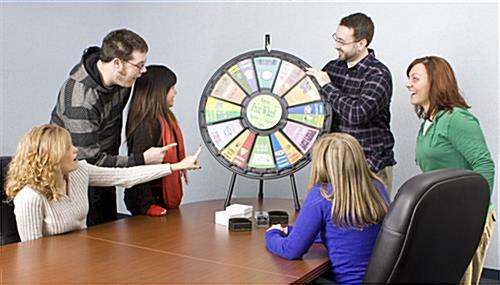 This game wheel keeps crowds entertained at office meetings, trade show presentations, retail promotions and fundraisers. The gaming display features a 12-slot design, giving users freedom to custom design each section! 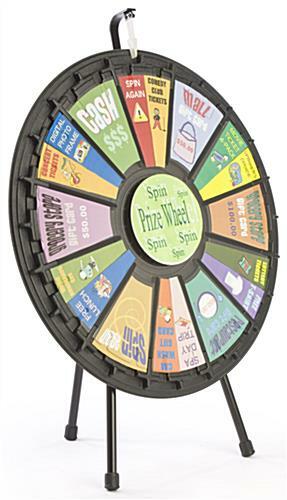 This game wheel differs from other prize wheels because of its changeable design. The gaming fixture has a total of 24 notches, therefore allowing users to switch from a 12 to a 24-slot display in seconds. 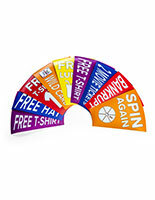 Designing each slot is easy with the provided templates. 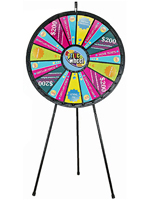 This game wheel, also known as a wheel of fortune, includes a nylon plastic clicker to create a loud and excitement-boosting sound. 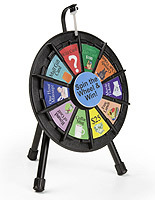 Passersby will hear the distinctive noise and will be drawn over to a presentation out of curiosity and enthusiasm, with the hope to win the fortune desired. 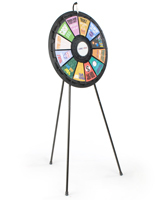 The game wheel has a tripod stand, with rubber feet, to keep a display in place even when the most excited participants play. 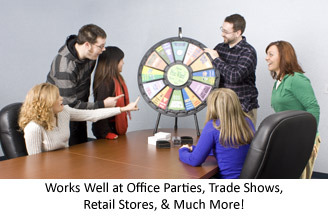 Simply position a spinning display on a table or counter to have your activity at eye-level. 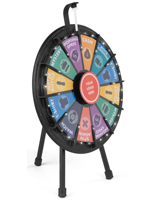 This game wheel, or wheel of fortune, is constructed from ABS and PETG plastic, making the fixture light enough to carry yet strong to withstand frequent usage. 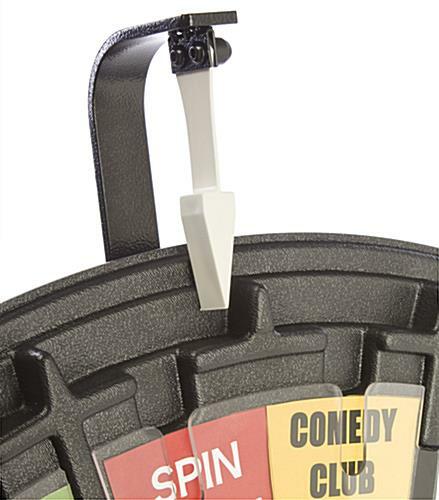 Additionally, the tabletop gaming fixture weighs only 11 pounds, making trips to and from events incredibly easy. 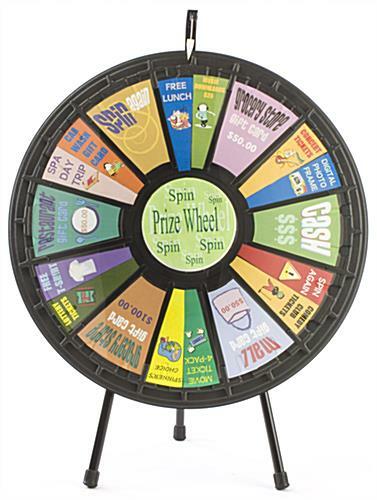 This prize wheel will add an element of entertainment to any presentation or gathering, ultimately helping to improve sales and success. 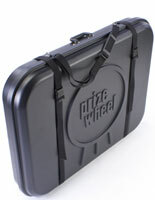 Please note: Is Compatible with this carrying case PWCASE31. 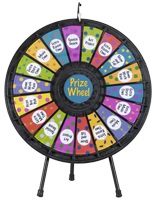 31.0" x 41.0" x 16.5"
The Prize Wheel is awesome. The slots were customized to show the individual holes on our golf course. The attached picture is my prototype. I had to send the artwork to a graphics design company as the desktop software I have was not working for what I wanted. It will be well worth the additional expense. 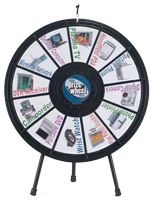 Your prize wheel looks great, Linn! Thanks for sharing the photo! 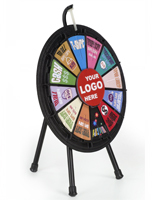 Very pleased with this wheel and it's flexibility to use for various company events. Thank you for the feedback, Phyllis!